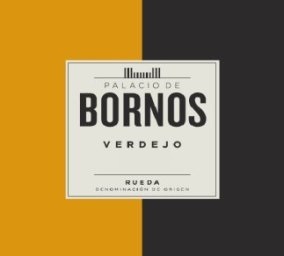 Palacio de Bornos Verdejo Rueda is made from 100% Verdejo. Mechanical and manual harvest. Fermentation takes place in stainless steel tanks at controlled temperature of 15-16º C for 18 to 20 days. Cold stabilization, filtration. Clay and limestone with small round stones. Straw-like yellow color with fresh green tones. Hugely aromatic, with tropical fruit, tangerine, lemongrass and lemon thyme. Fruity notes with anise and minerals, typical of the Verdejo grape. Full in the mouth, well structured, dense and persistent with a lingering aftertaste. The wine has great length and a delicious mouth-filling richness, and finished with a precise acid cut. As a light aperitif, ideal at any time of the day, with a tapas or small snack, with Pasta al Pesto, Mousse of Tuna fish and lime.. Enjoy with everything from sushi to spicy Cajun shrimp! "Even better, the 2017 Sauvignon Blanc Rueda has racy notes of lime and crushed citrus as well as plenty of flinty minerality in a medium-bodied, fresh, nicely balanced style. Showing a touch more tropical fruit with time in the glass, it has outstanding purity of fruit and a crisp finish that keeps you coming back to the glass. It’s another rock-solid wine from this estate." The winery was founded and began elaborating wine in 1870 in the town of La Seca, alongside the Appelation of Origin Rueda. In the late nineteenth century, its wines were well known throughout Castilla, expanding both nationally and internationally during the twentieth century. In 1976, the fifth generation of the Sanz family broke away from the family tradition and started their own project with the construction of a new winery in the town of Rueda, thus beginning the most recent history of Palacio de Bornos. After more than thirty years of solid work, Palacio de Bornos has become one of the most widely renowned brands in the Appelation of Origin Rueda, and is present in the major markets worldwide. Appelation of Origin Rueda is located in Castilla y Leon and is made up of 72 municipalities, which are located in the south of the province of Valladolid, west of Segovia and north of Ávila. - Grape Variety: Verdejo, indigenous to the area, resulting in crisp, pleasant and highly harmonious wines that invite you to continue drinking. - Climate: continental with low rainfall, marked temperature contrasts between day and night and spring frosts, providing low yields and high quality. - Soils: gravelly, permitting great ventilation and drainage. Palacio de Bornos boasts 220 hectares of their own vineyards, in the towns of Rueda, Pollos and La Seca. When choosing a plot, the quality of the soil always takes precedence, with several analysis and soil samples being carried out to ascertain in detail its structure, thus ensuring that the vine will develop in the most appropriate soil. The soil of our vineyards is characterized by a calcareous clay subsoil and gravelly top soil, with a high concentration of boulders, allowing for good aeration and drainage, ideal characteristics for the successful development of the vine. The special commitment to the vineyard have led Palacios Bornos to develop continuous research projects - mainly in the field of clonal selection, vine spacing, rootstock and foliar nutrition - through studies at experimental estates. The results, once positively tried and tested, are applied to the entire vineyard. The aim has always been to plant the best vines in the best soil, in order to obtain the best wines. Pale Yellow color with fresh green tones. Very aromatic, with citrus, tropical fruit, tangerine, lemongrass and lemon thyme. Fruity notes with anise and minerals, typical of the Verdejo grape. Fresh in the mouth, the wine is slightly fizzy, with an excellent balance between acidity and sweetness. 100% Verdejo from the Rueda region. Fermentation lasts between 6 and 8 days. Pairs with appetizers, dessert or light meal.